The whispers of “imaging is dead” accompanied macOS High Sierra as Apple introduced Apple File System (APFS) to the Mac. Now, whispers have turned to shouts as macOS Mojave takes yet another step further in rendering imaging a thing of the past. 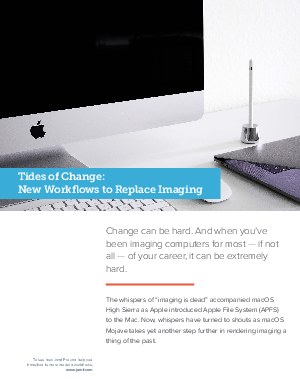 This white paper examines all things imaging and looks at the reasoning behind the transition, what new provisioning workflows are available to you, and the benefits of adhering to a more modern deployment method.